I have the distinct honor of posting the first interview for my wonderful friend, Monica Wyrick. She was a shining model of motherhood when we met nearly 16 years ago, and she’s been a kindred spirit of creativity ever since. In fact, I was fortunate enough to have her illustrate my first children’s book, knowing that she’d done several books for the venerated Audrey Penn. Wow, huh? I know. 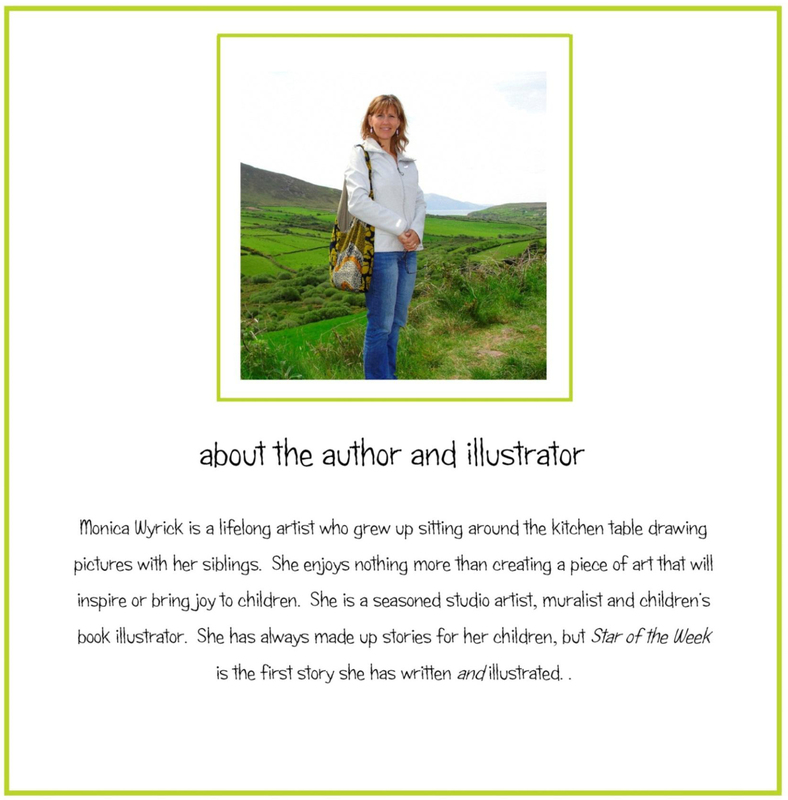 But on Friday, Monica’s first book that she’s illustrated and written will formally release. I’ve already read it and it’s wonderful. It’s a great story about self-esteem and figuring out what’s shining about yourself … it’s a great story for girls and boys. What better way to introduce you to her than a little Q&A. How long have you been an illustrator? I have been illustrating books on and off for about 15 years. Did you always know you wanted to illustrate books for children, or did that genre come into focus once you became a mother? I remember having to write a paper for one of my art classes when I was in college. We had to say what our dream job would be as an artist and I wrote that my dream job would be to illustrate children’s books! Do your children like to draw, too? I think all children like to draw! They are all natural artists. My “children” all in college now, and I don’t really think any of them draw a whole lot anymore, but I do think they are all talented artists. Who are your biggest influences as an artist? Of course Maurice Sendak. I also love William Joyce’s books. And I find that I am drawn to all of Picasso’s art, even the weird stuff! Star of the Week is the first book you’ve written and illustrated. Do you like doing both, or prefer just illustrating? It’s kind of great illustrating you own book because you don’t have to try to get in the author’s head, you’re already there! When I’m illustrating someone else’s book I try very hard to talk to them and to make my illustrations as close to how they are seeing it as I can get. Sometimes that can be hard. Do you illustrate by hand, on paper, or on the computer? I illustrate by hand, on paper the old-fashioned way! But I do some clean-up work on the computer. How did you prepare for life as an artist? Being very observant of people, colors and just sort of how things relate to each other helps. Work is kind of feast or famine, so if you are a person that is very used to a regular schedule all the time being an artist might not be for you. It is also good to not have to live an expensive lifestyle! What’s the most interesting job you’ve ever had? That’s very hard to say. It would almost always be whatever job I am working on at the present. But I recently painted a giant mural in a toy store and that was really fun! If you could travel anywhere and do anything while you were there, where would it be and what would you do? For a long time the answer to that question would have been to go to Ireland and Scotland and hike in the mountains and visit castles, but I did exactly that last March! So now I would say that I would really like to go to the Alps and hike there and stay in a house like Heidi’s grandfather in the Shirley Temple movie. I have wanted to do that since I was a little girl! If you could meet any famous artist, living or dead, who would it be and why? Easy! Leonardo DaVinci. Because he is not just an artist, he was a true renaissance man, I would want to learn about the time he lived in and the people he knew and all of his inventions, plus I hear that he had a lot of secrets. Maybe he would tell them to me. How can you support Monica, and your favorite authors and illustrators? GO to your local independent bookstore and ask them to carry Star of the Week, and Monica’s other books. they’ll mail a copy of it to you! and give it 5 stars! have her sign it for you! to your child’s permanent library. SPREAD the word … nothing helps promote a great book than people who have read it and loved it. Thanks for this great interview. I enjoyed learning even more about Monica. I can’t wait to get her book and have her autograph it for me next week-end. I hope y’all have a great time!